Once you have created a Trip you are able to generate an IMO Crew & Guest list from it at any point. 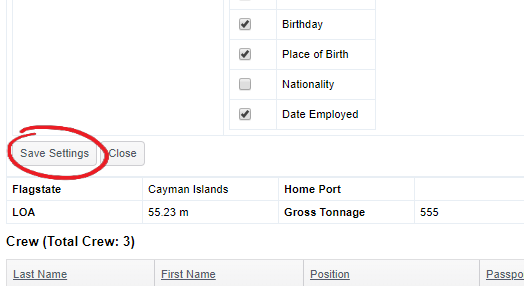 The Crew List will list all required information about your crew, guests, vessel and voyage that you have entered into the system. This will open a new browser window showing you all Crew & Guests who are currently marked as onboard, along with some basic vessel information, shown in a landscape format which can easily be exported to pdf for printing. 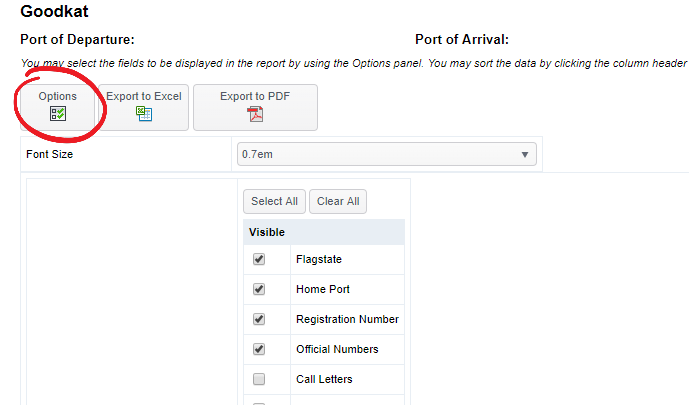 If you have some information that you would like removed from the list, or additional information added, you can click the options button and turn each field on or off. Pro Tip: You can actually change the order of the crew & guest information by clicking and dragging each field. Once you have set all the fields click 'Save Settings'. By doing this our system will then automatically remember these settings, so you will not have to do this again.